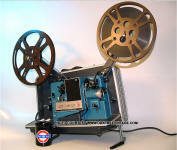 Restored Film and Movie projectors for sale! With 90 day Warranty! We fully test and to the extent that is 'monetarily practical', refurbish / restore each second-hand projector offered for sale (unless being sold for a 'prop' or 'as-is'. We use film that is in good shape, with sprocket holes that are not worn. Each projector is checked for belt / drive condition, frame sync, lamp(s) condition, switching condition, focus, Sound quality (where applicable), AC safety, excess transport noise and overall function. Each is cleaned and lubed where necessary. Projector should be "ready to go" when you receive it, however film projectors are complicated machines and film can be very fragile, especially older film (and most of it is). Always check your films sprocket holes for quality. Worn, deformed, torn, stretched sprocket holes and warped film will cause problems when playing back which typically manifests itself in shutter glitches and noise. The problems may only last a frame or can last seconds or indefinitely if the film is in really bad shape. (Probably 70-80% of our test films have sprocket hole issues.) Also double check the loading and always go slow and load carefully, as that is when most problems happen. While our projectors are warranted for their basic function, we cannot guarantee that you will always get glitch free viewing and that films will not break and be "eaten", especially during the loading process. I doesn't happen often, in fact rarely, but we all remember watching school films and the teacher having to stop and splice, rewind or further adjust the film and projector to continue. We just found a source for some German made Plastic, Super-8mm take-up reels with Regular-8mm hub adaptors. 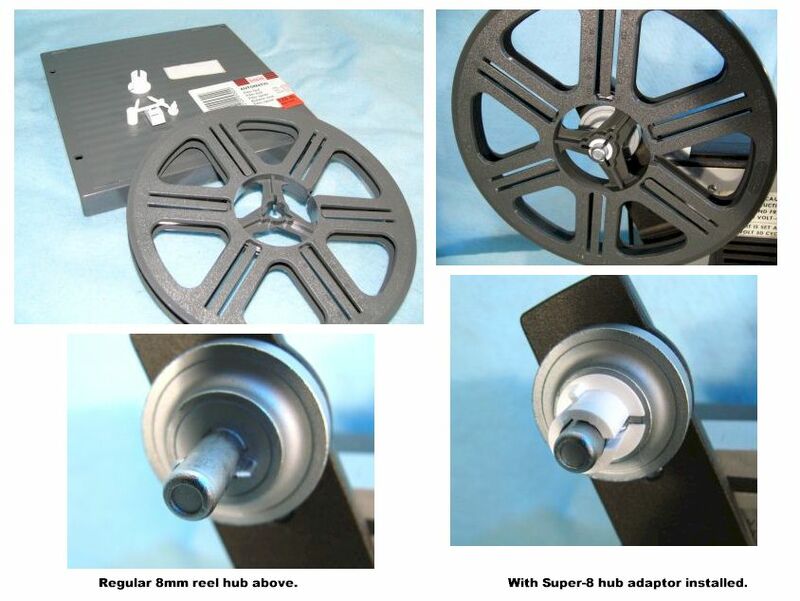 These reels will fit any 8mm projector as they can be used without the hub adaptor for Super 8 film projectors and with the hub adaptor for Regular-Standard 8mm film projectors. The reels are new and will have no warping like about 50% of the older, vintage reels still in existence. They also feature "film grabbing" so if your projector is 100% auto-load, the reels will load themselves. 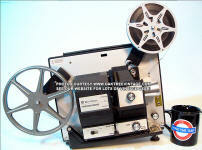 Each reel has a capacity of 400' and comes with a case and an adaptor. Auto-Load: While "Auto-Load" can work to varying degrees on different film projectors models, it is notorious for eating films. The overall design went through an evolution over the years, but even the best designs will eat films on occasion. This is usually due to poorly trimmed film, excessive curling of film (usually associated with smaller reel diameters), bent / crumpled leader ends. An excessively "curled" film can be almost impossible to "auto-load". Film eating can also be due to projector maintenance issues and poorly designed transport sprockets. Projector Chatter: A well maintained and properly adjusted projector should not "chatter" when projecting film with good condition / clean sprocket holes and properly done splices. However, even the best projectors will chatter when trying to project film with torn, worn, missing and otherwise imperfect sprocket holes and bad splices. Film breakage: Other than "Auto-Load" / Loading issues, most film breakage is caused not from the actual film breaking, but from previous splices breaking. Most any film over 50 feet will contain splices and some that are shorter will as well. If you are going to be running film through a projector, you WILL want need to have a splice block and FRESH splice tape for your format(s) of film handy. You WILL break film. Not much is more frustrating than to have a broken film in the middle of a project with half of it residing on the take-up reel and the other half still on the "feed" reel and no way to repair or make the splice. Flicker-Free / Flicker-Reduction: Flicker is usually an issue when doing film to video transfers. It manifests itself by an image that varies in degrees of brightness, similar to watching some of the early 1900 silent films. It happens due to the film shutter and the video camera shutter, being "out of sync". Typically silent film is shot at 18fps (frames per second), and sound film at 24fps. Video operates at 30fps. "fps" refers to how many times per second an image is projected or picked up. Even if both were the same fps, they would not be in sync, without a lot of very sophisticated equipment that is beyond the scope of most users means. There are a number of "work-arounds" to reduce or eliminate flicker. The first, and best is to use a 5-bladed shutter model projector. Some projectors can be retrofitted with a 5-blade shutter or may have come originally with one. These can be relatively expensive. The flicker is eliminated by projecting more images than is necessary for the video camera to pickup, thus there is always a projected image regardless of whether the video camera shutter is open or closed. The next way is to use a "semi-pro" or professional video camera that has an "infinitely variable" speed shutter. As of this writing, the low end of those cost $2000 and can go up to around $5000 before reaching "pro" status. Flicker can be reduced or eliminated in some cases, by "riding" the camera speed control, while monitoring the video signal on a monitor (the control needs to be infinitely variable. Having 2 or 3 different speed choices is not sufficient). The easiest and typically least expensive way to reduce or sometimes eliminate flicker is to vary the speed of the projector. Many film projectors came with a "variable speed" (needs to be an "infinitely variable" type and not just a choice between 2 or 3 speeds) control from the factory. If not, some lend themselves to being modified by a qualified technician by having one added. Another possible way to achieve variable speed on a projector that doesn't have one is to control it externally, using a device such as a "vari-AC" (have a qualified technician determine if your projector is a candidate for use with a vari-AC and know it's limitations and methods for safe use. If a variable speed projector is used, again simply "ride" the speed control while monitoring the image on the video monitor, as you would with a variable speed camera. Flicker cannot always be eliminated, but can usually be reduced to an undetectable degree. Lamps / Bulbs: Due to the intensity required to project a small image from film, through a small hole, only part of each second, some times distances of 40 feet, projection lamps must be very powerful. This power comes at the price of short life. Most projector lamps have life spans of 10-50 hours and are very fragile thus, should be handled carefully. Noise: Film projectors are very complicated mechanical things, with lots of moving and integrated parts. There will always be a degree of mechanical noise made by any film projector. It will very in degree by model. Some will be relatively quiet and some will seem quite noisy. Silent / Sound switch: This is more of an issue with 16mm Film projectors, but the "Silent / Sound" / "Speed" mechanical switch should never be manipulated with the projector is not running. To do so in most cases, will require the projector be partially disassembled to re-seat the drive belt. Again, this is usually not a problem with 8mm units or units that make the change electronically. Sound quality: "Consumer" film in either 8 or 16mm formats had varying degrees of sound quality. There were many factors that could and can effect sound quality. One is the accuracy of the camera that shot the film originally. If it's speed was not correct or constant, that sound will be imprinted on the film and will play back no better. 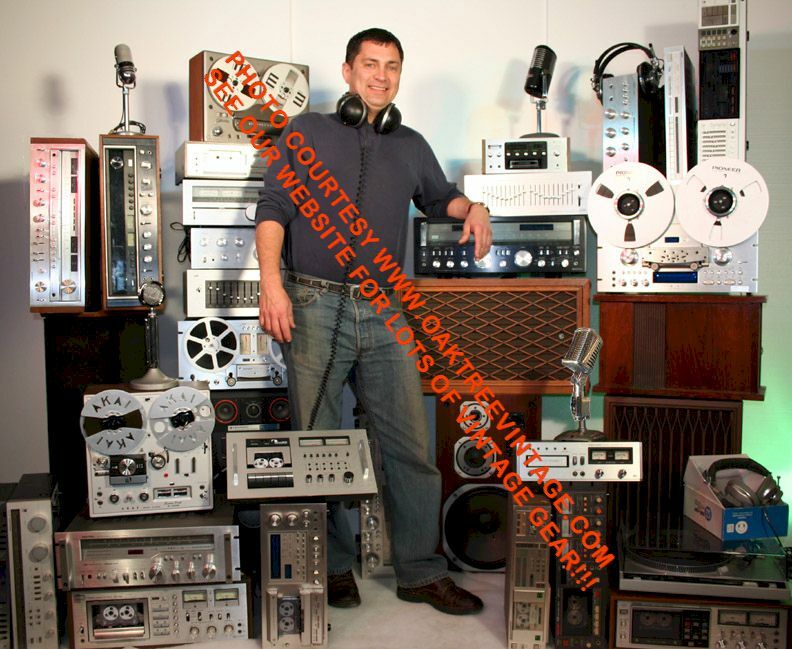 Sound can vary from usable to laughable in quality, so don't expect Hi-Fi quality by any stretch of the imagination. Still Function: In order to do "Still" image projection the film must stop. In doing this, most projectors will engage a lamp filter to reduce the amount of light, thus heat hitting a single frame of film. Also, since projection principle incorporates rotating "blades" that alternatively block light, there is no guarantee that when you stop forward motion, you will be on a blade opening, thus light may be partially or completely blocked. This will result in a partial or no image. It sometimes takes 2 to a dozen tries to get the "sync" correct, so you see a complete image. Further since there is a filter or light block used in "still" mode, the brightness of the image will be reduced. Note; due to the tremendous amount of heat produced by most projection lamps, a projector should not be left in "still" mode for more than a few seconds. 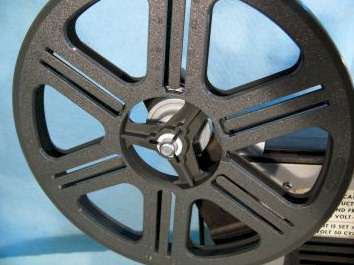 Longer may result in warped, melted or severed film and a mess to clean up in side the projector film gate. Zoom Lens: Zoom actuation will vary on different projector models. Some lenses actually have to be physically pulled or pushed to zoom. Foot note: Film projectors are very complicated, electro-mechanical devices. There are many sub-assemblies and systems within each, and all must be working well together for the unit to function with any accuracy and dependability and not "eat", damage or destroy your precious films and movies. The moving parts always rely on lubricants to function properly and there are commonly a few rubber parts / components as well. 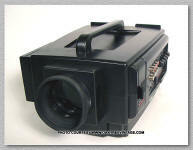 Most projectors you see available today, were originally sold from the 1950's through the early 1980's. Thus at best a projector is probably at least 25 years old. Most are 30-40 years old. Interesting things happen to 30+ year old lubricants and rubber parts. Lubricants actually coagulate and will cause "close tolerance" parts to seize or freeze up. Rubber parts can become brittle and cracked, only to break when the unit is started up. The rubber can also revert back towards it's natural state and become a gooey tar. Virtually every used projector out there will need and require 4-18 hours of technician time to be brought to a "usable" state. Simply "turning one on and getting some things to spin with no smoke coming out" is not a revealing test, nor a basis for making a decision to purchase. Our typical customer has previously purchased 3-5 units from individual sellers, who all stated such things as, "we turned the unit on and it works fine", or "we ran a reel of film through it and it worked great", or "never used, still in box" (those are usually the worst condition and the most difficult to breath life back into), or my personal favorite, "no way to test, but projector looks like it should run great!" Needless to say, none of those statements typically held true. It's not that people are trying to "rip anyone off" (I'm a believer that YOU are generally the person that allows yourself to get "ripped off"), it's just that most non-professional sellers of film projectors, stereo gear, guitars, microphones, keyboards or any other technically minded items should find other things to try and sell, such as old doilies and used baby booties. Heck, if I had an electron-microscope, a race horse, or an F-15 fighter jet, to sell, I would be the last person you would want to talk to about their "real" condition. All I would be able to say is, "it looks like an F-15, doesn't have any rust, and the tires are holding air. It must be ready to fly, right...!???" *Due to stock levels, spare NEW lamps that are sometimes included with projectors, may ship separately at a later date. Projector always at least, comes shipped with existing working lamp to get you started.